FC Dallas' Marvin Chavez (18) leaps over the diving save of Revolution goal keeper Matt Reis (1) during a Major League Soccer match at Pizza Hut Park in Frisco on June 4, 2011. FC Dallas battles the New England Revolution during a Major League Soccer match at Pizza Hut Park in Frisco. 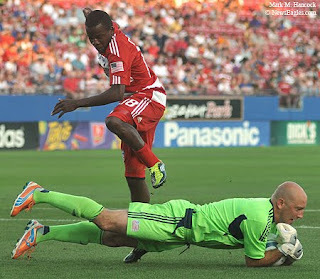 FC Dallas won the match 1-0 over New England. Named in this slideshow are: Kevin Alston, Brek Shea, Marvin Chavez, Didier Domi, Matt Reis, Eric Alexander, George John, Ryan Cochrane, AJ Soares, Fabian Castillo, Andrew Jacobson and Stephen McCarthy. 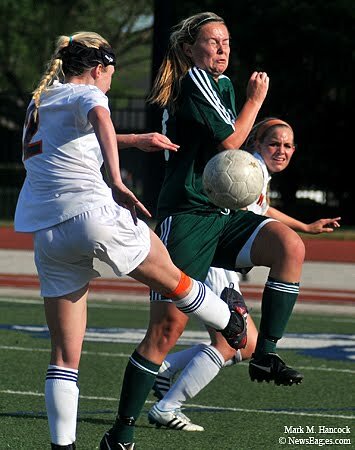 Waxahachie senior Caroline Clifton (18) braces to be hit by the ball as Fisco Wakeland junior Katey Carmichael (2) tries to pass to sophomore Maddie Lundberg (14) during a high school playoff soccer game at Standridge Stadium in Carrollton on April 8, 2011. Waxahachie battles Fisco Wakeland during a high school soccer playoff game at Standridge Stadium in Carrollton. Named in this slideshow are: &nbsp Katey Carmichael, Tierney Thomison, Jennifer Perry, Caroline Clifton, Ashley Kingston, Maddie Lundberg, Kourtney Holleman, Danielle Tesei, Bridget Reid, Sarah Hay, Christine Sparks, Karleigh Hector, Lexie Devore, Ashley Vega and Natalie Kelly.